The pinnacle of shine from science and nature in harmony! Pinnacle Signature Series II Paste Wax is the wax of enthusiasts who desire a warm, wet-looking shine on all paint colors and types. Pinnacle Signature Series II Paste Wax combines “Ivory” Brazilian Carnauba with fruit oils and liquid crystal polymers to infuse your paint work with a bright, wet, highly reflective shine that shimmers across the paint. 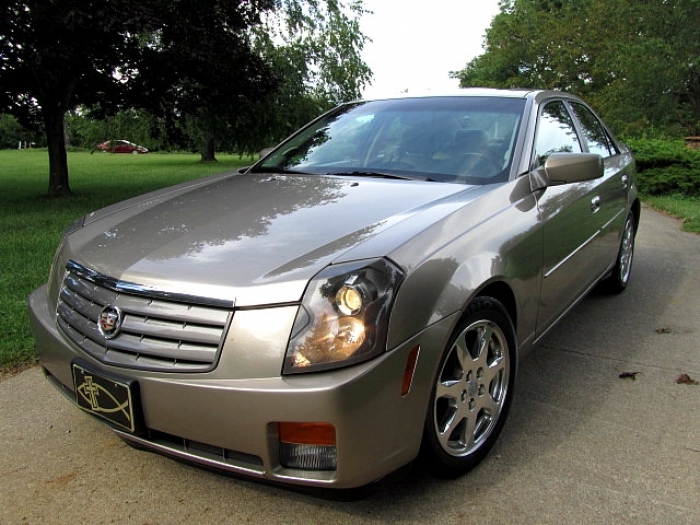 It is Pinnacle's signature look, regardless of paint color. It is a shine with out equal. Signature Series II is a wipe on, wipe off wax; no hazing time required. Pinnacle Signature Series II Paste Wax is hand crafted with “Ivory” Brazilian Carnauba. “Ivory” Carnauba is created when the highest grade of natural carnauba, Brazilian T1 one, is refined to remove impurities. The result is a pure wax that creates a liquid shine while remaining crystal clear. 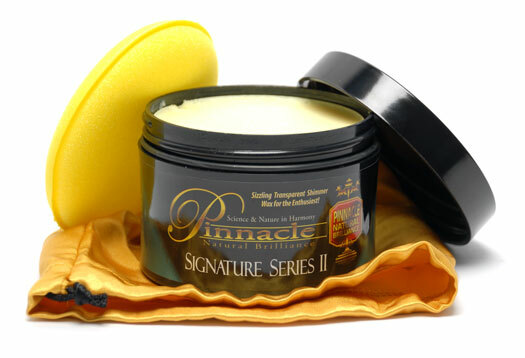 Pinnacle Signature Series II is then hand crafted with natural fruit oils that wet the paint. To increase shine and durability, specially sourced liquid crystal polymers are added. This unique wax is carefully blended and cooked to precise standards. Each jar of Pinnacle Signature Series II Paste Wax is hand poured and allowed to cool in a controlled environment. The combination of refined “Ivory” carnauba, fruit oils, and liquid crystal polymers creates a wax that benefits all paint colors. The result is Pinnacle Signature Series II saturates all colors with a brilliant shine that dances across all paint colors and looks stunning in all light settings. It is a glossy, wet finish that can only be created by enthusiasts for enthusiasts. The scent of natural fruit oils is immediately noticeable as you open your jar of Signature Series II. This soft paste wax is best applied with the soft, included foam applicator. As you swipe the applicator over the wax you will see it melt on the pad. Now massage Pinnacle Signature Series II onto your paint a section at a time. It will melt into the paint. Using the supplied microfiber cloth, buff the section clean while Signature Series II is still wet. Repeat until your automobile radiates with bright, highly reflective shine. Signature Series II makes the paint on this 2010 Porsche Carrera reflective and glossy. For the absolute best results, gently wash your automobile with Pinnacle Bodywork Shampoo and dry carefully. Use the extremely fine Pinnacle Ultra-Poly Clay to remove any foreign contamination from your paint work, restoring it's original luster and leaving it perfectly smooth. Finish preparing your paint with Pinnacle Paintwork Cleansing Lotion. Apply Pinnacle Signature Series II by hand, massaging into the paint and removing, a section at a time. Note: Pinnacle Signature Series II does not contain cleaning agents or harsh solvents. It can be a layered for more shine and will not stain trim. ProsPleasant smell, easy to apply like butter, removing is a breeze too, but the shine is the most impressive thing !!! A little pricey but it's the best wax I've ever used. Goes on easliy and buffs to a great and long lasting shine. Bugs usually just rinse off the front after a trip. Best wax for light metallics! Hands down, my favorite wax for light colors. Like all PBMG waxes, it goes on and wipes off like butter. Smells great too. But the best quality is the shine and depth it gives, which is very hard on light colors. It also makes metallic flakes shimmer in the sunlight. I used this prior to 3 car shows for my 03 Sonic Blue Lightning and my fathers 04 Screamin' Yellow Cobra. My Lightning looked as if the paint was melting, it was gorgeous, my fathers yellow cobra looked absolutely amazing and we both got many compliments. It doesn't last particularly long, maybe a few days for a outside car and a few weeks for a garage queen. It does however like pollen but pollen is easily removed with a waterless wash or quick detailer. ProsThe depth, gloss, and clarity this product provides to paint is amazing, to light color or dark color paints, it works! I applied this to my Torred SRT Charger and the look it gave was quite impressive. This wax is fantastic what else can I say? Pinnacle wax is the real deal. I have been detailing my own cars for 25 years and this is the best wax I have found. My cars are black so I am very picky about how they look. great product. I have long been a fan of Pinnacle Souveran Carnuba wax for my convertible that I don't drive everyday but it just doesn't last long enough to use on my daily drivers. Signature Series II fits that bill perfectly. Its ease of use is similar to Souveran but it lasts at least twice as long. It also doesn't hurt that it is $40 cheaper than the Souveran. Great product. I just now waxed my 2013 Genesis with the pinnacle Signature Series II wax, I'll let you know how it stands up to this Texas sun. It makes the paint look great so far, and yes wet looking! Proseasy of application on the vehicle, and ease of removal off the car, I do like the way it goes on and smells. It states that you can get 25 waxes out of the jar, I think I can get 3 times that out of the jar! ConsI did not receive a microfiber cloth with my order as stated in the ad. Product goes on easy. Enhances the paints color and leaves a nice shine. It appears to protect the paint and lasts longer then several other products I have tried. It is expensive but worth the extra money. We have used it on Classics and daily drivers. We even tried it on acrylic aquariums and were amazed at its clarity. ProsThe fact that is goes on easy, protects, and lasts. ConsThe fact that it does not appear to be sold in stores for ease of purchasing. Great LSP. Easily to apply and remove. Leaves exceptionally good depth and warmth to the paint after applying a sealant.